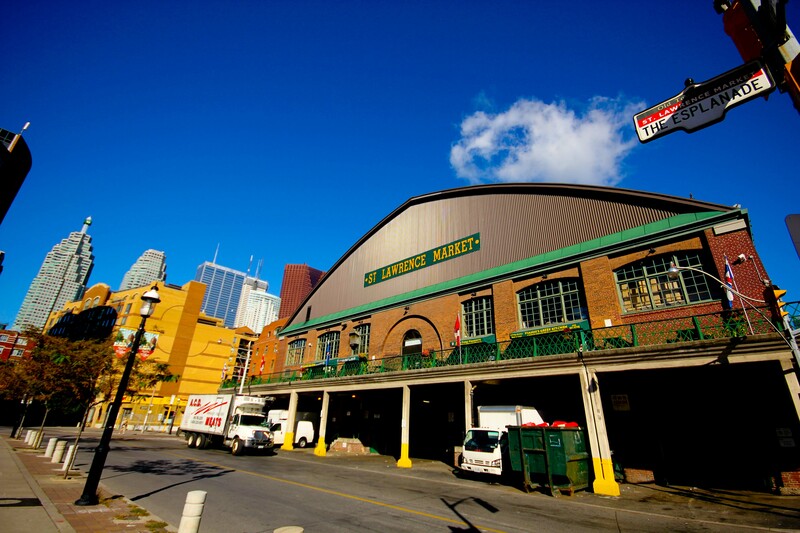 In my food loving opinion, the real taste of a city comes from its food markets, so with that in mind I eagerly anticipated visiting both the St Lawrence and Kensington Markets in Toronto. 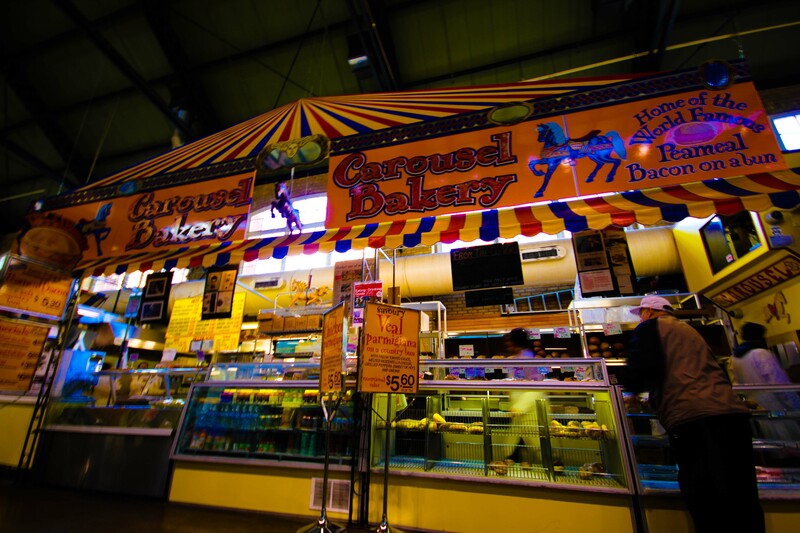 I made a date with a fellow food lover to meet at the St Lawrence Market early Tuesday morning, (it’s closed on Mondays). When I heard he’d be a bit late, I took the opportunity to snap a few photos outside. And sample some Kozlik’s mustard inside the market. 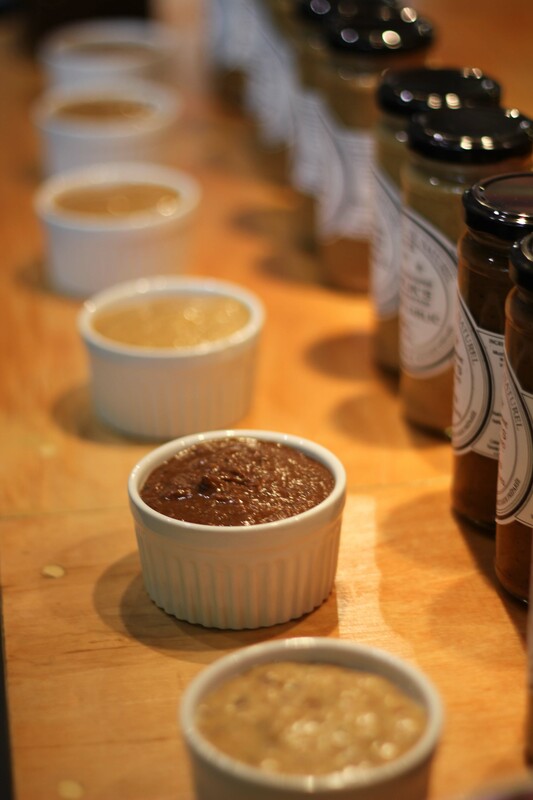 I tried a bunch and came away with the Amazing Maple Mustard and an intensely spicy Horseradish mustard. We made our way though the aisles inside and although there was a nice selection and variety of food, I compare all markets to Granville Island and this one didn’t have the same energy or food quality. The main floor had some nice food purveyors, but the lower level just seemed dingy. Where the market did seem to shine was in the different prepared food stalls they had. 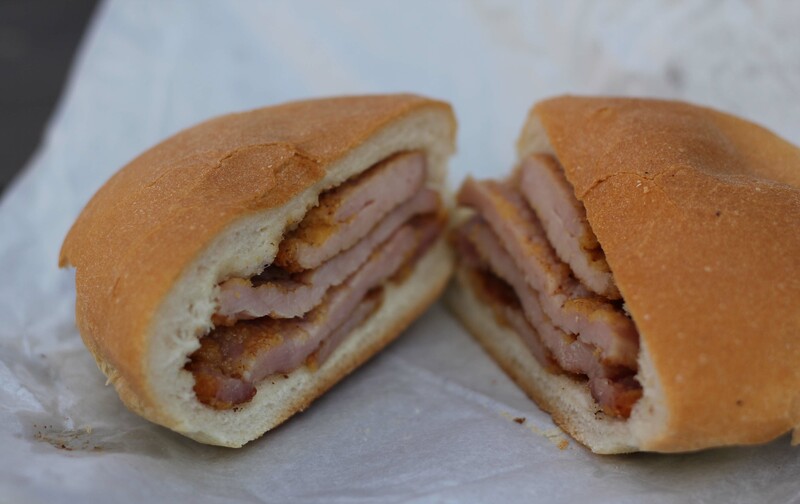 If I had more of an appetite, I would have tackled the fried tilapia or a chicken parmesan sandwich, but I knew I there was one thing I had to try, and that was the peameal bacon. There were a few places in the market that sell the peameal bacon sandwich, but I was led to believe this was THE place to get it. I was enticed by the version with egg and cheese, but was convinced that for my first experience I had to go pure. I kept on envisioning the dried out back bacon that usually accompanies a bad eggs Benny. This was so much different. It was very moist and nicely salted, and topped with some honey mustard such a pleasant morning treat. Thinking back, this would have been even better topped with the maple mustard I had just bought. 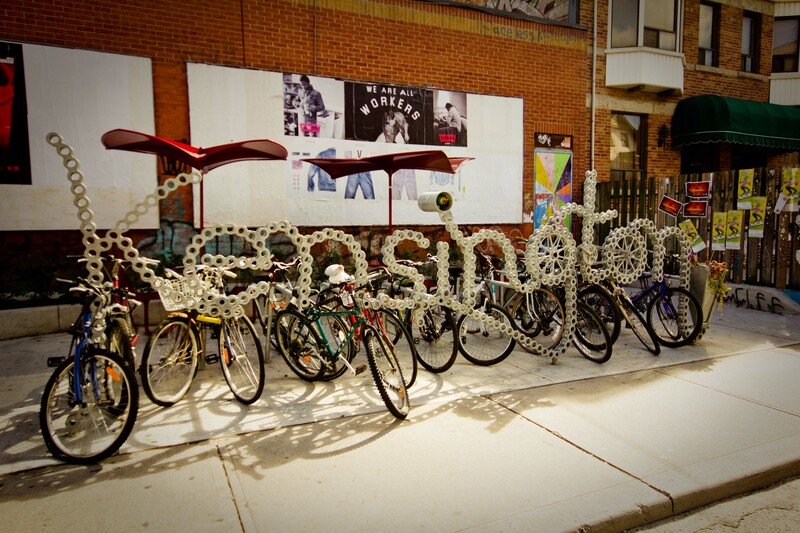 The next day I met up with my food explorer again at the Kensington Market. My first thought was, “where’s the market?”. What I soon came to understand was that Kensington Market wasn’t an actual structure where they had food vendors, but more like a food neighbourhood that was called Kensington Market. Seemed cool enough to me! There were small stores selling fish, cheese, meats, you name it and it seemed to be there. We planned our attack of the market. We decided that we would share everything and not linger too long anywhere in the process. I stopped for a mediocre dry cappuccino at Casa Acoreana and we wandered through the streets to check out the offerings. 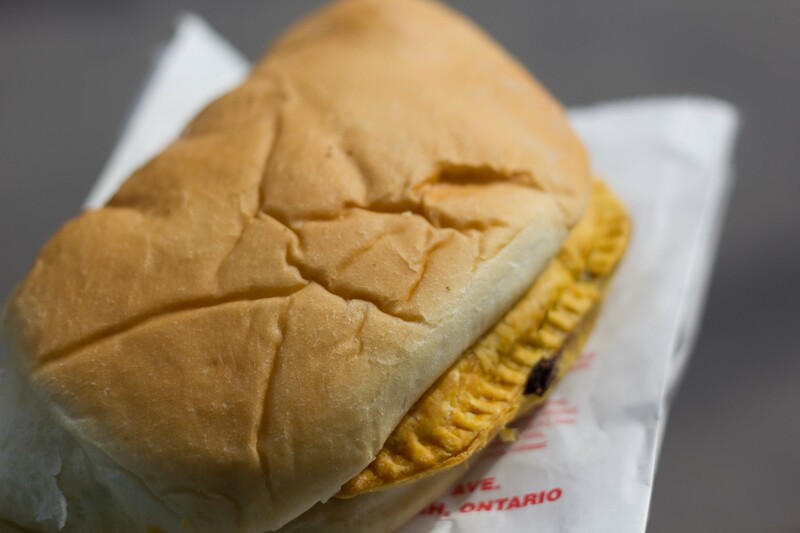 Our first stop was at Patty King for a beef Jamaican Patty and Coco Bread. It was served this way, with the bread wrapped around the patty. We weren’t sure if we were supposed to eat it like a sandwich or not. We chose to eat it separately. The coco bread tasted like a sweet egg bread. Upon doing some research on this combination, I’ve learned that we should have eaten it together, but that the bread should have been buttered for us as well. 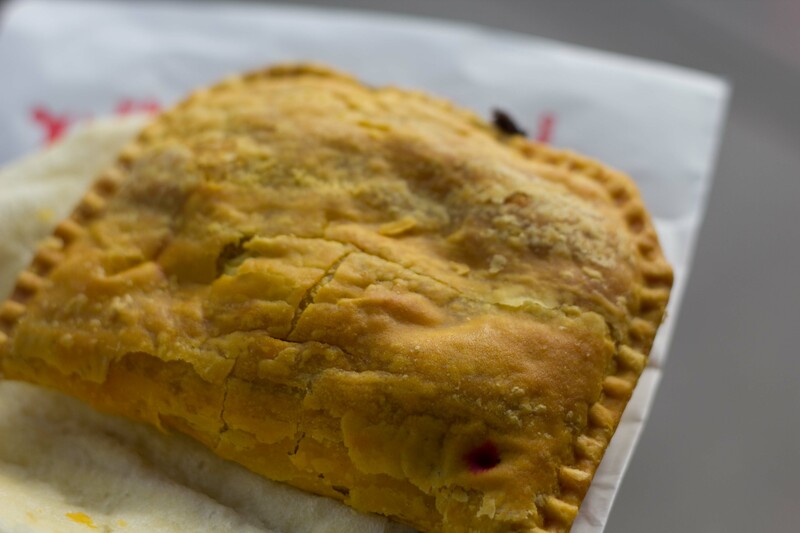 The Beef Patty on its own was yummy, although it could have been a bit spicier. Our next stop was at Emporium Latino for some good ol’ street treats. 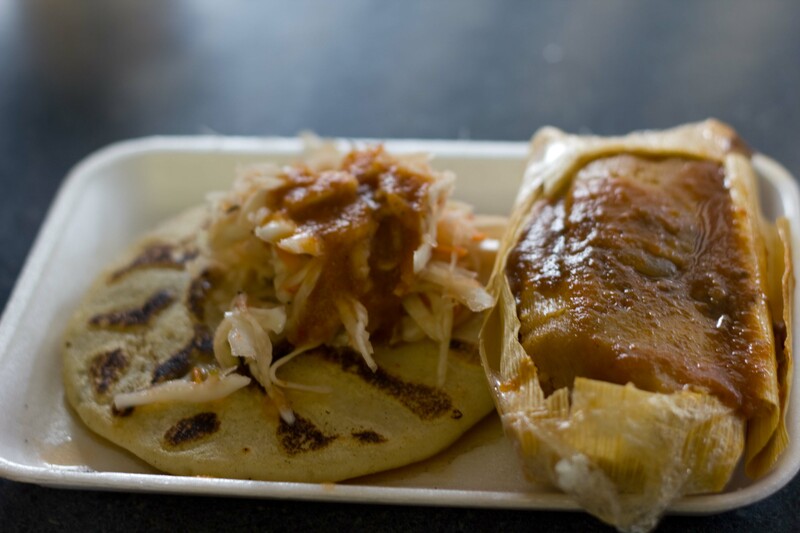 We debated over the extensive menu and decided on a Mexican style chicken mole tamale and El Salvadorian pork and cheese papusa. My excitement waned a bit when the sweet old cook in the back grabbed my tamale out of the fridge and threw it in the microwave. But I hung around the back and witnessed as she carefully prepare my papusa from scratch. 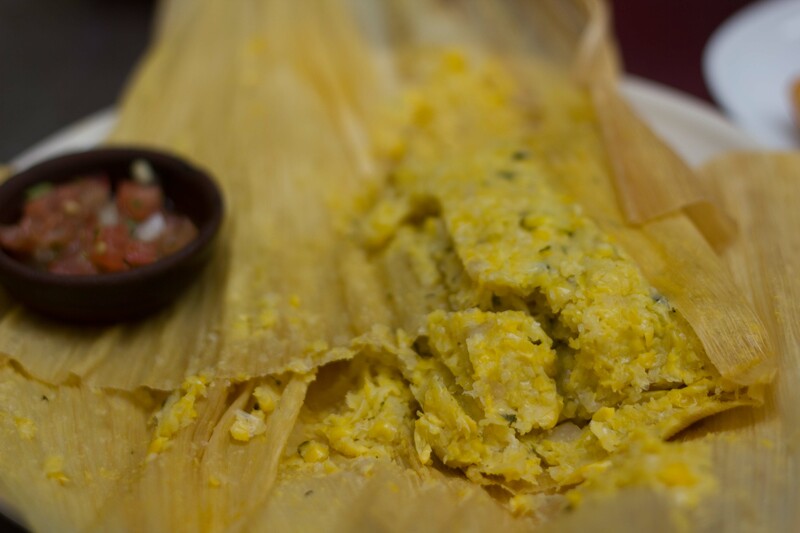 The tamale and papusa were both ok, and could have greatly improved with more spice added to them. My favourite part was the pickled cabbage on top of the papusa. 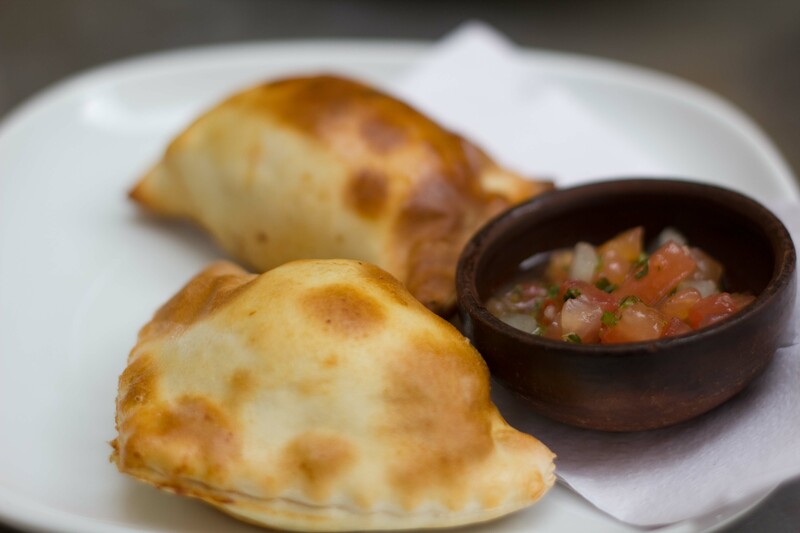 Our last stop was at Jumbo Empanadas for some Chilean fare. I was told to get the corn pie, but I’d also heard it was big, and by that point I was getting a bit full. Humitas was described to me as a very corn tamale. It was more like a dry creamed corn with onion and basil, but delicious nonetheless. And of course we got some empanadas, although I think it was a bit ironic that we decided to get the mini empanadas at a place called Jumbo Empanadas. As the “friend” in this story, I’d like to tell you again that you’re my favorite market-buddy and I can’t wait to do this again in some other country or city! Right back at you E! And thank you for picking out the most delicious Ontario peach I’ve ever had! Mmmm Bacon! How can you go wrong! Cool take on markets I’ve never been able to visit. Keep em coming!